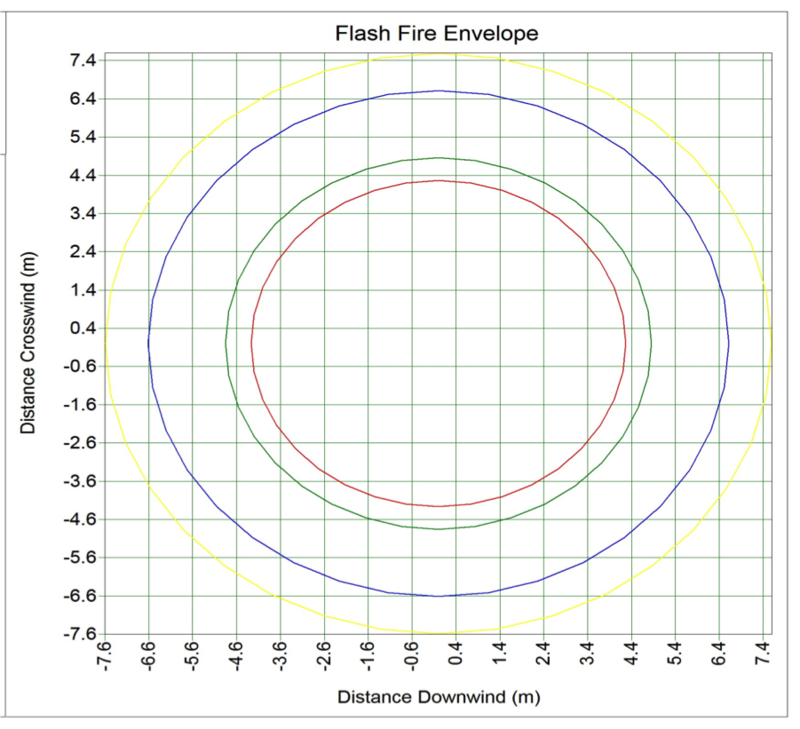 How are Dispersion Models and Fire and Gas Maps Different? Dispersion modeling and fire and gas mapping are different activities, but are closely related. 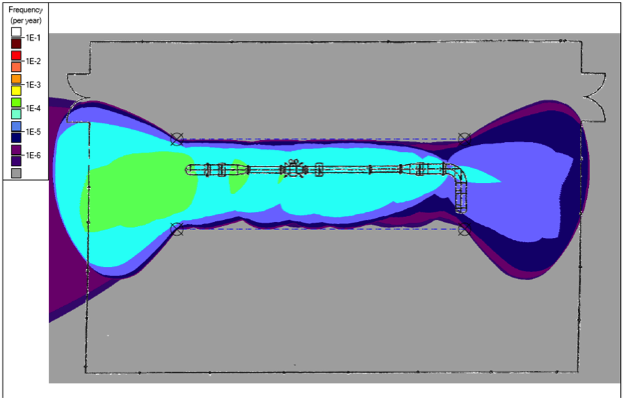 The dispersion modeling activities are performed to determine where and how frequently releases can occur in a process plant, and when they do, what the size and shape of the released material are. These dispersion models can subsequently be combined with leak rates and leak rate distributions to determine frequency and event trees to handle conditional modifiers such as occupancy and probability of ignition to quantitative calculate overall risk and geographic risk profiles. An example of a geographic risk profile is shown below. In this figure, each color represents a frequency at which a release is expected to be present at a specific location. 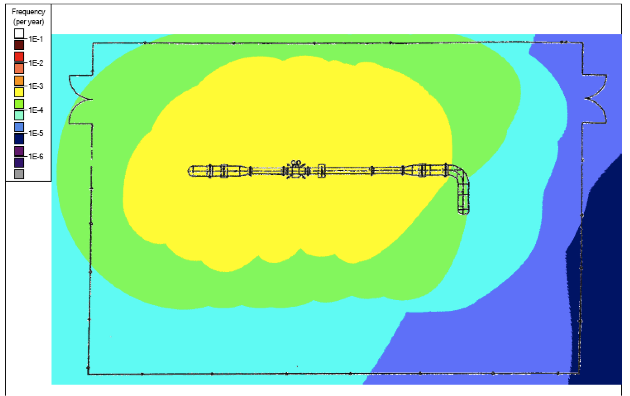 The figures above are created by running a set of dispersion models that will give the dimensions of a the gas cloud expected to occur as the result of a range of leak sizes and atmospheric conditions (such as the one shown in the figure below). This set of dispersion models is the replicated thousands or even hundreds of thousands of times for all of the various wind directions and weather conditions to yield the geographic risk profiles. Fire and gas mapping on the other hand looks at a given array of fire and gas detectors and determine what the array can “see”. 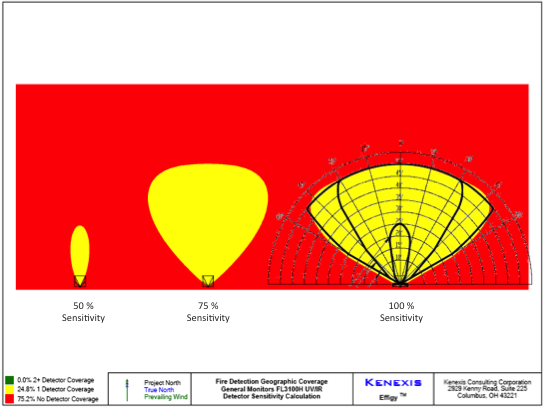 This is performed by considering the “cone of vision” of an optical fire detector for a design basis fire size scenario or the design basis cloud size for a gas detection system. These viewable areas for each device are then combined considering the effect of obstructions to calculate an overall coverage area (i.e., geographic coverage) at a given elevation of interest. 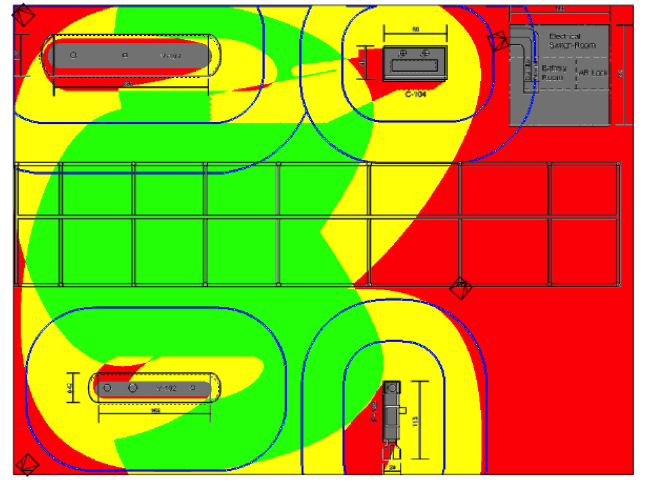 The first figure below shows a vendor “cone of vision” overlaid on a single unobstructed coverage map. 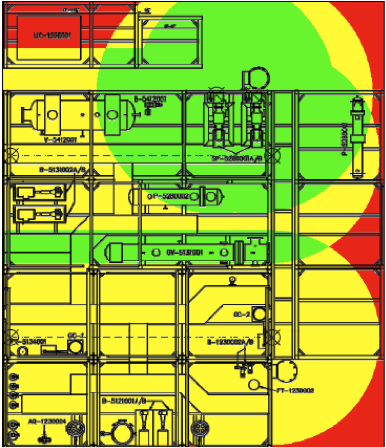 The second figure presents an actual geographic coverage map for a multiple optical fire detector array where red represents no coverage, yellow represents single detector coverage, and green represents two or more detector coverage. When these two activities are combined (i.e., determination of where the hazards are LOCATED and determination of where hazards are COVERED), an assessment of whether or not tolerable risk has been achieved can be made. By Edward Marszal|2017-06-25T19:58:15-04:00May 11th, 2011|Author, Edward M. Marszal|Comments Off on How are Dispersion Models and Fire and Gas Maps Different?